Home > Facts > How Long Before You Know You Have Chronic Fibromyalgia? Fibromyalgia like its counterpart M.E (Myalgic Encephalomyelitis) can and often does materialise and then disappear without warning leaving the sufferer in a state of confusion as to whether or not they are getting better or simply feeling better in their mind. One of the most common misconceptions about both these conditions is that they are psychosomatic and are simply the product of an anxious mind. This is most definitely not the case and both Fibromyalgia and M.E (Myalgic Encephalomyelitis) are very real conditions with very real symptoms attached to them. How Can I Be Sure I Have Fibromyalgia? Initially it is hard to tell for sure if you have been afflicted with either of the aforementioned conditions. This is because they both have a tendency to ‘flare up’; meaning that they can cause the sufferer great discomfort and distress one day and show no symptoms at all the next. It is unfortunate that both Fibromyalgia and M.E (Myalgic Encephalomyelitis) are conditions that can take some time to develop to the extent where they are diagnosable by your doctor. I Have Good Days and Bad, Is This Normal with Fibromyalgia? Many sufferers of Fibromyalgia have good days when their condition is manageable and bad days when they find it almost impossible to function to any degree of normality. This is something that researchers are trying to understand but for the most part at the moment it would seem this is because the condition itself may have its roots in the sufferer’s genetic make-up. Indeed there are suggestions that Fibromyalgia can be hereditary. How Long Do I Have to Have Fibromyalgia Before it is Considered Chronic? Rather like its counterpart M.E (Myalgic Encephalomyelitis) Fibromyalgia is referred to as Chronic Fibromyalgia if the sufferer has been plagued by it for a period of six months without a break in its attack of the body. As with M.E (Myalgic Encephalomyelitis) your doctor will carry out a series of tests designed to confirm or deny whether or not the condition is Fibromyalgia. This involves testing a series of pressure points (18 in total) around the body and also measuring resistance to pain etc. Again as with M.E (Myalgic Encephalomyelitis) Fibromyalgia can have a myriad of other symptoms most of which can be treated with conventional prescription medications whilst the underlying condition itself has no cure or recognised treatments that prevent it from getting any worse. 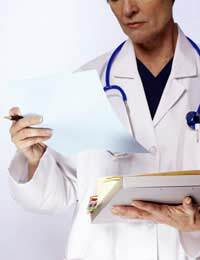 How Long Does It Take a Doctor To Diagnose Fibromyalgia? This is a question that differs in answer depending on your GP; in reality a lot of doctors are not particularly clued in on Fibromyalgia and consider it for the most part to be something that is a product of a depressed mind. Those doctors who are knowledgeable on the condition could make a diagnosis in perhaps three months but you should be aware that it can take much longer given the fact that the symptoms of the condition – just as with M.E (Myalgic Encephalomyelitis) vary from patient to patient. It is worth noting that no two sufferers will have the same ailments as a result of Fibromyalgia which is why the process of diagnosing it can take so long. Also it is worth recognising the fact that many doctors are wary of making a diagnosis too early these days in case it is the wrong one and leaves them open to a negligence claim. If you are concerned as to whether or not you have – or think you are in the early stages of contracting Fibromyalgia – then you should consult your doctor as soon as you can. He or she will be able to perform the necessary tests and offer some useful advice and support although it is worth mentioning again that your doctor will only be able to treat those ailments which are the symptoms of Fibromyalgia as opposed to treating the condition itself. Can I request that my GP refer me to a specialist in the illness. Do fibromyalgia specialists or even GP'S with knowledge of this condition exist in the UK. All the Gps that I have seen claim to know very little about the condition. I am immensely relieved to finally have a diagnosis that offers a rational explanation for the myriad of chronic poor health symptoms I have suffered over the last 14 years!I am a 47 year old RAF veteran who was recently diagnosed as suffering with chronic Fibromyalgia.Whilst serving in HM Armed Forces, this condition was not recognised; my strong sense of duty compelled me to request premature voluntary release (PVR) when I recognised and accepted that I was unable to fulfill all my military obligations and duties - I didn't want to be a burden to my colleagues. I strongly suspect that my Fibromyalgia was first triggered in 2002 by physical and mental exhaustion when I returned to full-time military service 12 weeks after the physical trauma of an Emergency Caesarian section; At the same time, my husband who was also a serving RAF officer was posted away from home, leaving me to raise our two young children on my own.Furthermore, my spine was injured during child-birth but this post-natal complication was not discovered until I stopped taking the pain-killers prescribed for the Caesarean section and six months after giving birth I was diagnosed with post-natal depression and chronic fatigue, when I stopped breast-feeding. Aged 33 and accustomed to being very capable and athletic, I pushed myself hard to meet my full personal and professional responsibilities when I should have taken time to rest and recover completely.I believe that UK military cultural norms In 2002 did not support the preventative course of action I should have taken and the RAF organisational beliefs, values and "can do" attitude that I held dear was at odds with my need to recognise and accept evident physical, mental and psychological limitations; consequently, I did not take sufficient time to recover and I have been treated repeatedly for chronic: back and neck pain; inflammation and excessive swelling; weakness and pain in hands and feet; acid-reflux, bloating and other IBS symptoms; chronic fatigue; sleep disorders and low mood leading to depression throughout the last 14 years. During this time, I received excellent healthcare and I was diagnosed and treated for anxiety and stress, depression, stomach disorders, recurring physical pain particularly in my neck, back, and around joints where sports-injuries had resulted in tissue damage.Since 2009, I have also experienced problems in regulating my body temperature and debilitating severe migraines have more frequently.I am optimistic that 2017 will be a turning point - With the help of neighbours, friends, family and the excellent support I am receiving from local NHS healthcare professionals I am learning to pace myself and identify my limits so that I can minimise and manage my chronic symptoms and lead as full a life as possible. Any top tips would be gratefully received. I have been suffering with fibromialgia since the birth of my son in Dec 2012. That seemed to trigger a more aggressive form of this disease. I seemed to be managing the symptoms well by joining a gym, as advised by my rheumotologist, and amitryptoline, with just a few bad flare ups. However, the past 3 months have been unbearable!! My medication is no longer a high enough dose and i can't really up them as they make me so tired on top of the fatigue I already feel! This is not an option as I have a 4 year old little boy and I work 2 days a week. The job is not physically strenuous but is mentally and with the increased brain fog I'm really struggling!! I am fighting to keep my life the same and at the same pace but I feel like I'm only just keeping my head above water. Work have been great but I don't think they fully understand the condition. I'm sinking deeper into a depression that I DESPERATELY do not want to get into but I do not know where to turn!!! I feel judged for how I feel and know that people do not believe me when I say how much pain I am in which iswhy I push myself so hard. If anyone can give me any advice I would be forever greatly!!! @Paddy- sorry to hear this. There are support groups you may be able to join that could help you deal with your illness better. You may also be able to ask your GP if you could go on an NHS-approved patient course to help you cope better with your condition. Please seee NHS link here. I hope this helps. It took me two years to be diagnosed and many trips to the dr and back again before been sent to the hospital to see a consultant and been diagnosed, and many months of work and due to my illness i had to stop working as i became unreliable to work as i could not do the job i was doing. My illness had started when i had started to fall asleep at work and at friends houses. The only test for fibro is the pressure point test, there is no other tests to show that you have this.